This is our final post in a series spurred by our review of 69 public files for new chemicals we received from EPA’s Docket Center. For most of these chemicals, EPA made a determination that they are “not likely to present unreasonable risk” under the Toxic Substances Control Act (TSCA), which greenlights their entry into commercial production. In our previous post we demonstrated EPA is not complying with a number of provisions under TSCA that require the agency to make public the premanufacture notices (PMNs), notices of commencement (NOCs), and information that is submitted with them. In this post we look further into how, through these failures and others, EPA has impeded meaningful transparency in the new chemicals program. As originally enacted in 1976, TSCA recognized the value of public access to information, like health and safety information (see, e.g., TSCA § 14(b)). Even in EPA’s original (1983) regulations establishing the new chemicals review program, EPA recognized that “[p]ublic participation cannot be effective unless meaningful information is made available to the interested persons” (see here p. 21737). Among the many flaws of the original TSCA, however, was the law’s inability to ensure EPA delivered the promised transparency when it came to both information EPA receives and the agency’s decisions on new chemicals. The amendments to TSCA in 2016 were meant, in part, to expand public access to information about both chemicals and agency decisions, and in doing so increase public confidence. For instance, under § 26, EPA must now make available to the public “all notices, determinations, findings, rules, consent agreements, and orders.” And under § 5, EPA must now make an affirmative determination on new chemicals, which under § 26 must be made public. These changes, in addition to the original TSCA provisions, clearly envision a robust program under which the public is able to readily access non-confidential information on new chemicals and information on EPA’s decisions about them. Coupled with the policy changes EPA has made, the concerns we raise here make clear that EPA under this Administration intends to weaken a new chemicals program that Congress sought to strengthen through TSCA reform – and hide as much of it from public view as possible. EPA’s failure to publish Notices of Commencement (NOCs) and EPA’s determinations on confidentiality claims for specific chemical identity in those NOCs. One of the key reforms to the Toxic Substances Control Act (TSCA) made by 2016’s Lautenberg Act was the expansion of who can access confidential business information (CBI) submitted by companies to EPA. The old law largely limited access to federal government employees and contractors. Congress recognized the enormous value such information could provide to officials at other levels of government and to health providers and environmental officials treating or responding to chemical releases and exposures. It therefore mandated that EPA expand CBI access, subject to certain conditions specified in the law. In March, a full 21 months after passage of the Lautenberg Act, EPA finally issued draft guidance documents setting forth how it intends to meet the law’s mandate to expand access to CBI. Unfortunately, as has been the case with so many other aspects of TSCA implementation under the Trump administration, EPA got a lot of things wrong in its draft guidance documents. 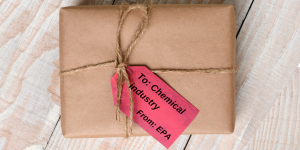 This is the third in a series of blog posts based on our frustrating, and frustrated, efforts to get information on premanufacture notifications (PMNs) for new chemicals under the Toxic Substances Control Act (TSCA). The saga began when we requested from the EPA Docket Center the public files on 69 new chemicals, most of which EPA had determined were “not likely to present an unreasonable risk” under the TSCA, as amended in 2016 by the Lautenberg Act. This series of posts analyzes and describes what we did, and did not, get from the Docket Center, to which EPA staff pointed us when we raised the fact that such files are not available on EPA’s website or at www.regulations.gov, despite EPA regulations requiring they be. make the public files electronically available (40 C.F.R. §§ 700.17(b)(1), 720.95). EPA has repeatedly committed to increasing the transparency of its new chemicals program. Unfortunately, our review of the PMN files we received has revealed massive gaps and inconsistencies in the information EPA does provide to the public, and all too often we are finding that EPA has entirely failed to comply with the law and its own regulations. These failings are on top of efforts by the agency to actively hide information on new chemicals that it had made public for decades. Late yesterday, EDF filed our Opening Brief in our case challenging EPA’s Inventory Notification Rule. The Brief was filed with the U.S. Court of Appeals for the District of Columbia Circuit. Our Brief argues in favor of the public’s right to know. Among other arguments, it explains that EPA erred by allowing companies to assert “Confidential Business Information” (CBI) claims that do not meet the law’s requirements. As a result, EPA will be concealing information about chemicals, particularly information about specific chemical identities, in violation of the public’s right to know. EDF also filed our two-volume Addendum supporting EDF’s standing to pursue this lawsuit. The Addendum proves that EDF uses this kind of information to study and communicate to the public about chemicals and to advocate for measures to protect public health. EPA’s response brief in the case is due to the Court on May 21, 2018. We recently started a series of blog posts describing what we did, and did not, get from the EPA Docket Center when we requested the public files on about 70 new chemicals, most of which EPA had determined were “not likely to present an unreasonable risk” under the Toxic Substances Control Act (TSCA), as amended in 2016 by the Lautenberg Act. To continue our series, we address in this post EPA’s pervasive failure to require companies to adequately substantiate Confidential Business Information (CBI) claims, and its own apparent failure to review such claims, despite clear requirements to do so under § 14 of TSCA. Twenty months after passage of the Lautenberg Act, we simply must ask: When will EPA start carrying out its new responsibilities on CBI claims – which includes compelling companies to comply with the law? First, to provide some context, let us address a question we were asked based on our first post: whether the PMN situation we are describing is any worse now than it was pre-Lautenberg Act. We suspect it is not necessarily worse. However, the purpose of the reforms to CBI in the Lautenberg Act was to fix these problems, by requiring substantiation and EPA review of most CBI claims, including those asserted in premanufacture notifications (PMNs) submitted for new chemicals. By and large it appears this is simply not happening, 20 months after the law passed and those provisions took effect.